An Amazon listing suggests that PS3 players will get an hour of bonus Connor. While developer Ubisoft announced at this year's E3 conference that its upcoming historical stab-fest Assassin's Creed III would feature four PlayStation 3-exclusive single player missions, the company hasn't since given us much indication of what these missions might involve. Although details remain scarce, one clue as to the size of the missions may now have appeared in a British Amazon listing for Assassins's Creed III which features a shiny little "60 minutes of exclusive content" stickeron the PS3 version of its box art. If we assume that the British arm of Amazon's box art uploading crew is doing its job properly, now might be a good time to engage in some math. Four missions split across sixty potential minutes equals four fifteen-minute missions, or maybe some mixed-up stylin' arrangement such as one half-hour mission, one fifteen minute mission, and two little seven-and-a-half minute numbers. Maybe they could be fetch quests? The only thing we know just now is that you'll need a PS3 if you really want to find out. At time of writing, the Amazon US page for the same product remains box-sticker-free, though it's likely that this difference is nothing more than a regional variation in either potential box art or Amazon upload habits. Though taking Amazon's word as law is generally not best practice, in this case, there doesn't seem to be much reason to assume that its box-sticker is lying. 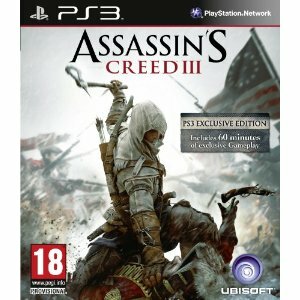 Assassin's Creed III will be released for Xbox 360, PlayStation 3, and PC on October 30 2012.